the choice of the cross, of obedience unto death. The Sacrament of Confirmation completes the process of Christian initiation. This is a personal decision to accept, profess and live the Catholic Faith and a commitment to put into practice the grace of the Holy Spirit given at Confirmation. But it needs to be clearly understood that receiving the Sacrament of Confirmation must be your personal decision. It is not something that must be done because "the family" expects it of you nor is it a "spiritual graduation" or "group" activity. It is a personal step that everyone must take when moved by a desire to make a deeper commitment to the faith. If you want to take this important step in your life of faith, then we, Monsignor Chet, Fr. 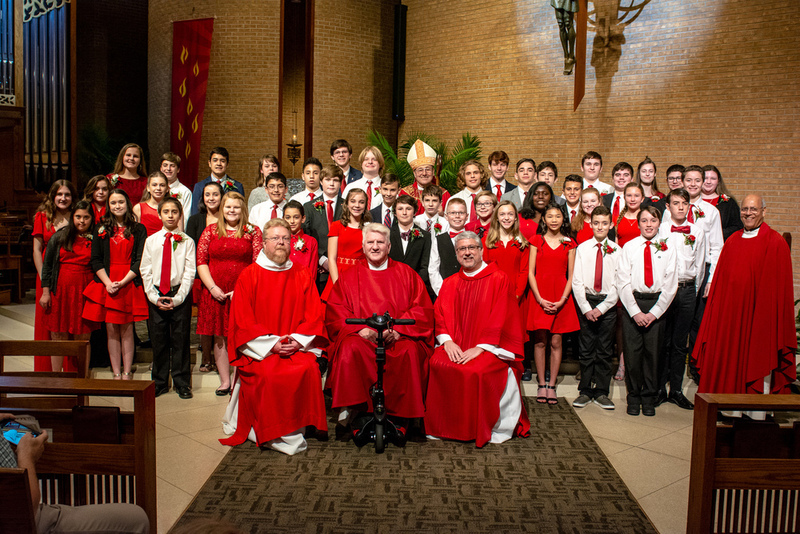 Jacob, Deacon Paul, Deacon Jim, parents, catechists and support staff at St. John the Beloved pledge our support and help in preparing you for the celebration of Confirmation. Here are a few suggestions that will enrich your journey to the Sacrament of Confirmation, 1. Choose a sponsor. 2. Complete 10 hours of service. 3. Attend a retreat. 4. Choose a Confirmation name. FOR 2019-20 WILL IS AVAILABLE ON THE LEFT OF THIS SCREEN!
" Through the Sacrament of Confirmation, a person celebrates the gift of the Holy Spirit and a renewed commitment to his/her belief in the Catholic Church. "